This Easy Orange Chicken Recipe is sure to be a hit with the whole family! It’s sweet and tangy, and coated in a sticky homemade orange sauce that is perfect over rice! 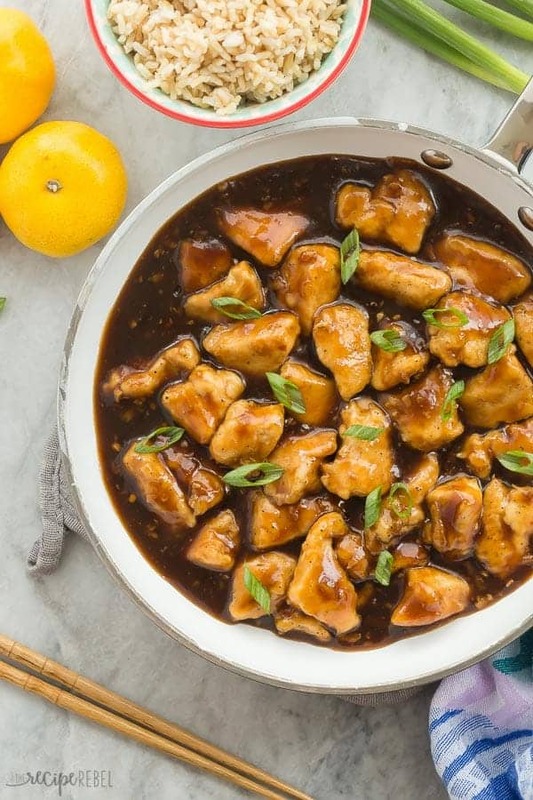 Forget the takeout — this Orange Chicken is ready in just 30 minutes with one pan! Life is a little crazy around here at the moment. Our girls are 6, 3.5, and 6 months, and they are just not slowing down. They’re all in such different stages that it makes things very interesting! Our 6 year old is wrapping up Kindergarten and getting ready for grade 1 (after a long summer off and lots of naps! ), our 3 year old is getting ready to start Nursery school in the fall (and has this energy you guys… I don’t know where she gets it. If she ever starts drinking any sort of caffeine — look out). And our 6 month old wants so badly to be on the move, and I’m sure she’ll get there before we know it. 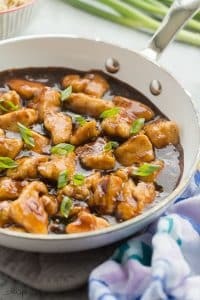 So easy 30 minute meals like this Orange Chicken? ESSENTIAL. Cook up some instant rice (I’ll be honest, I mostly gave up on long grain rice quite a while ago), throw some veggies on the table (my girls prefer them raw! ), and you’re set. 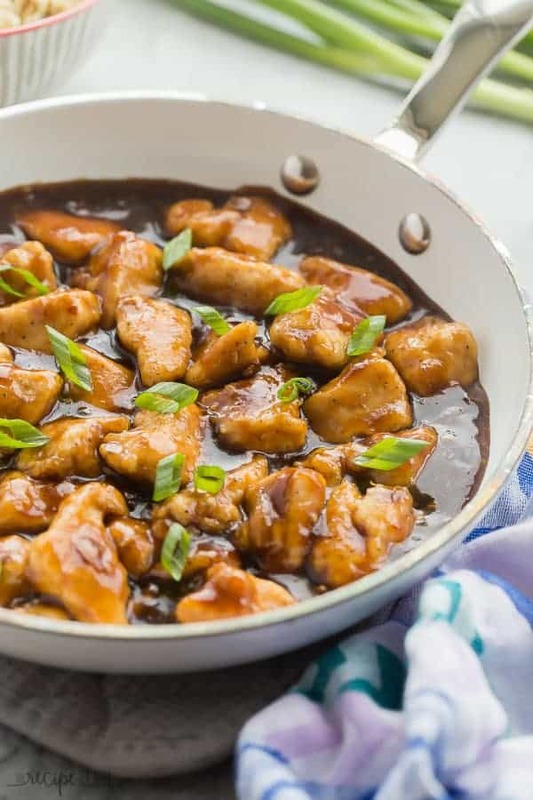 This Orange Chicken recipe is naturally gluten-free, but be sure to check all labels carefully, especially the soy sauce. This Orange Chicken is naturally dairy-free, but again, be sure to read all labels. This recipe can easily be adapted for the oven or the slow cooker as well! To bake in the oven, follow the method outlined in this Baked Honey Lemon Chicken recipe. To make in the slow cooker, see instructions below. Coat and brown the chicken in a frying pan according to the original instructions. Add the chicken and the sauce mixture to the crockpot, and cook on high for 2 hours or low for 3-4 hours until the sauce has thickened and the chicken is cooked through. It couldn’t be easier! This is a great way to prepare orange chicken for a potluck because it is so easy to keep warm without overcooking. And I guarantee it will be one of the first things to disappear! This Easy Orange Chicken Recipe is sure to be a hit with the whole family! It's sweet and tangy, and coated in a sticky homemade orange sauce that is perfect over rice! 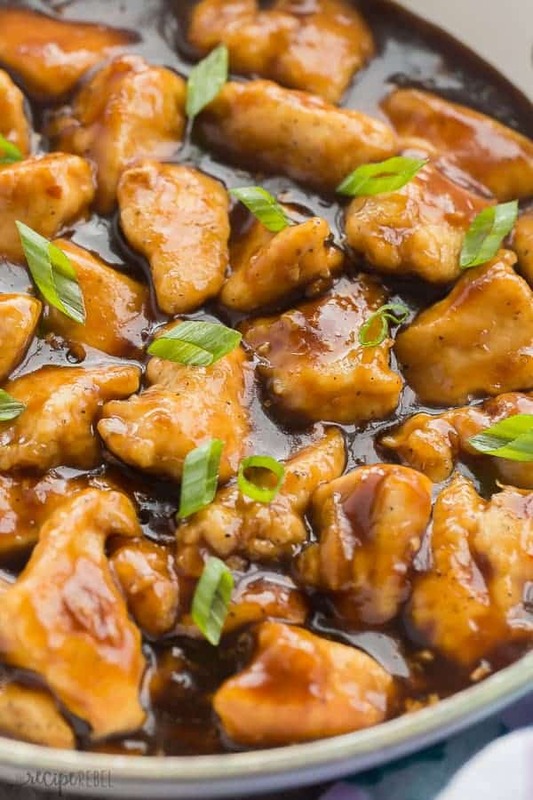 Forget the takeout -- this Orange Chicken is ready in just 30 minutes with one pan! Place chicken pieces in a large bowl and add 3 tablespoons corn starch, salt and pepper. Stir to coat. Heat a large pan over high heat and add oil. Add chicken to the pan and cook over high heat, turning once, just until browned, about 2 minutes per side. Meanwhile, make the sauce. Whisk together the marmalade, juice, soy sauce, vinegar, garlic, ginger, pepper flakes, chicken broth and 2 tablespoons corn starch. Once chicken is browned, reduce heat to medium and add the sauce. Cook and stir until sauce has thickened and chicken is cooked through (165 degrees F minimum), about 10 minutes. Serve over rice as desired. Orange chicken is one of our family favorites for takeout. I’m excited to make it at home now! Orange chicken is a favorite here! So delicious! This recipe is so easy and delicious! You can have it with rice or pasta! either way so good! This is so easy to make and so much better than take out. My family couldn’t stop talking about how good this was and the sauce was perfection!! THanks Steph! I’m so happy to hear that! This was delicious! The sauce thickened so nicely, and we served it over cooked cabbage for a low carb alternative. Is it okay to leave out the chicken broth? This was a wonderful recipe! I’ve tried a few orange chicken recipes at home, and this was by far the best. Also great is that it seems much healthier than the take-out version. My family (including a picky 6-year-old) loved it. Thanks, Ashley! That makes me so happy! Thanks Brooke! Tried this tonight – excellent! I subbed the white vinegar for rice vinegar but left everything else the same. Kids loved it! Thanks Erika! I’m so happy to hear that! Recipe says to add soy sauce in directions, but not listed in the ingredients or a measurement for how much to add. This is one of my favorite meals! It’s so easy to make and tastes amazing! I’m so happy to hear that April! Instead of unsweetened orange juice, could I use the juice from an orange as the “orange Juice”? This is my kind of weeknight meal! Love that sweet flavor! That sauce just looks amazing. I love the flavors here, especially the orange marmalade! Great easy weeknight meal.